Every day that you show up to work on your blog you are showing up for your clients. What does it mean to blog every day? You may think I mean you have to publish a new blog post every day. Rest assured, that’s not what I’m saying at all. I’ve never advised wellness professionals or other business owners to publish every day. In some industries, of course, things change quickly enough to warrant posting daily, but for the majority of businesses I recommend you start with once a month. That’s it! Then you can work yourself up to whatever feels right for you and your audience; that might mean once a week, once every other week, three times a month, or something else. 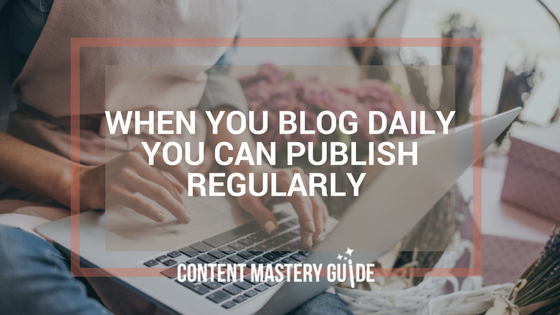 The point is that daily blogging doesn’t mean you’re publishing every day. It means you’re blogging every day. And by blogging, I mean you’re working on one or more of the many steps it takes to get from start to publish. Seven steps, actually, according to the method I teach. Unfortunately, too many people try to start, finish, and publish in one sitting – how exhausting! It’s also self-defeating, because you end up either walking away from the post and deserting it forever, or putting out something that’s not the quality you want. Splitting blog writing up into seven steps makes it easier for you to keep going, to keep publishing content on a regular basis, to keep showing up for your clients and yourself. Every day that you show up to work on your blog you are showing up for your clients. Even if they’re not seeing something new from you every single day, you’re thinking about them, you’re getting into their frame of mind, and you’re working on trying to solve their problems and give them the help that they need. When I made the connection in a previous post between showing up for your blog and showing up for your clients, readers told me it really brought home the point that the people out there who need your help also need to keep seeing new content from you. It shows them that you care about their problems. Blogging is a skill like any other – you’ll get better at it the more you practice. You’ll also develop more confidence in your blogging and your ability to show up and do what you said you were going to do. Once you’ve made the decision to blog every day, you don’t have to keep making that decision. After all, you don’t want your blog nagging at you like a hungry beast, always weighing down on you like something you should be doing. Make the decision once then let go of the decision fatigue. In return, you can settle into a routine of actually getting your blogging done, and use the same approach to meet other goals in your life as well. Another decision you no longer have to make? What to do first, and what to do next. As we discuss in my Write Less, Earn More free online training, when you have this replicable set of steps to follow, you always know where you are in the process and that makes it easier to know what to do next. You’ll know exactly what to do. James Clear writes about the benefits of having a disciplined process or routine to follow. In fact, he says you can forget about setting goals (like how many blog posts you’re going to publish every month) because when you follow a system, the goals take care of themselves. So instead of feeling the constant weight of “I have to publish a blog post this month,” let go and settle into the daily routine of working through the seven steps. Guess what? The blog post will get done, and you’ll have achieved your goal! Then you can start from the beginning again and write your next post. Consider the alternative: As the date looms nearer to when you wanted to have your post done, you’ll be stuck having to complete all the steps in one or two sittings. You have to switch through very different tasks in a short time. I don’t know about you, but my brain doesn’t work that way. Instead, I like to approach the blog writing process in phases, especially when it comes to things like brainstorming and outlining. I like to do those types of tasks when I’m feeling most creative – or whenever inspiration strikes! And I like to have some time and space between them and the nitty gritty of getting all of my words and ideas down in the drafting stage. Another important time for space is in between writing (the drafting and shaping stages) and editing. When you step away from a post and return to it later, you’re going to see things you wouldn’t have seen. You know what you meant to say, you know what you wanted to say, but you may not realize that it came out differently through your fingertips on the keyboard. 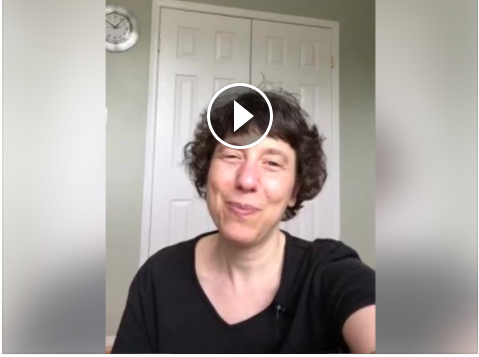 In this 25-minute Facebook Live video, I chatted about my own daily blogging habits and the tools I use to support them. I just want to say how much these have changed over the years since I started blogging in 2004. I’ve experimented with many different habits and routines. That’s a big part of what I see as my job in helping you with your blogging: trying different things myself so that I can report back to you on how they worked for me. My blog, just like yours, is a chronicle of things I’ve tried, things I’ve let go of, things I’ve added, things I’ve gotten excited about and then given up on or found something better. That’s just the nature of blogging. We all change our habits and our routines, and what’s working for us will change as life changes. This blogging routine is not what I did when I first started, and it’s not even what I did six months ago. It changes. Yours will change too, and it’s just important for you to try out different things and see how they work for you. Click the photo below to watch the Facebook video now. In a hurry? Fast-forward to the 11- minute mark for just the habits. In an even bigger hurry? Visit the description box where I’ve listed all the tools with links. We go into much more detail about the 7-step blog writing process in my free online training, “Write Less, Earn More With Blog Posts That Are Easy to Write and Irresistible to the Perfect Clients For Your Health and Wellness Business.” Claim your spot now at contentmasteryguide.com/webinar.